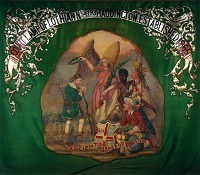 The proudest possession of many friendly societies was a giant marching banner. By the end of the 19th century these had become standardised in a pattern first popularised by George Tutill of London. 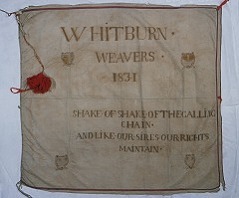 Based on fairground traditions Tutill's woven silk banners usually comprised a motto and name in straplines above and below a central painted panel, often with vignette scenes to either side. They hung from a horizontal rod supported by two vertical poles. It often took six or more men to keep them stable in windy conditions. Banners were expensive but vulnerable. Rain and wind caused strain. Light caused fading and discolouration. If stored in damp conditions then mould and rot could reduce them to fragments. Despite this a good number have survived. 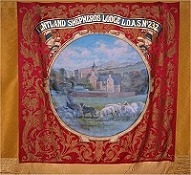 The oldest that survive are incorporation banners of the late 18th century or ones made for political campaigns of the early 19th century. 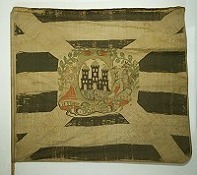 They tend to be small and fly as flags (from a single vertical pole). 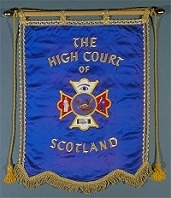 Perhaps because of their popularity the most numerous are the Tutill-style banners of the late 19th and early 20th centuries. 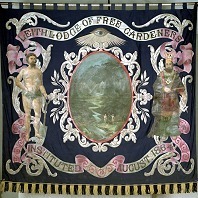 This style was adopted by trades unions and can still be seen on marches and rallies in the present day.